I have loved robots for as long as I can remember. 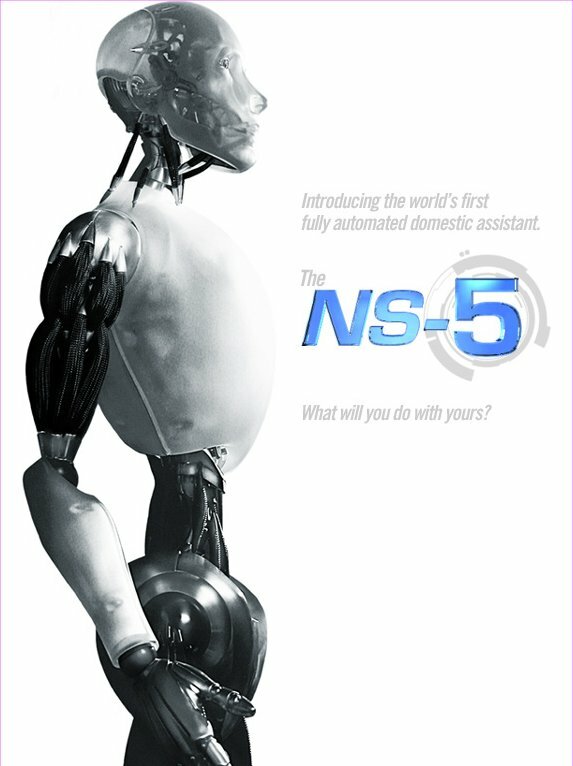 There is a common theme with most robot stories that I really enjoy. The theme involves a human creation that is physically and mentally superior to a human in many ways that simply wants to understand something like emotion. 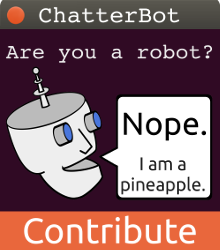 I think somehow I connect to the idea of a machine trying to be alive. It is the essentially the story of Pinocchio accept that in reality the robot does not get to wish to be alive. It is this struggle by a machine to understand life that I really enjoy and that has always been my inspiration for robotics. Today I just wanted to share some of my favorite robots to explain how they have influenced my robotics projects. From the 1986 film Short Circuit this robot which was originally dubbed SAINT Number 5. The acronym stands for Strategic Artificially Intelligent Nuclear Transport. 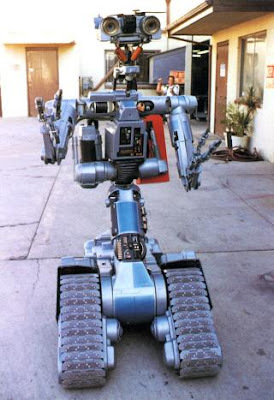 The robot was designed in the film for the purpose of carrying nuclear weapons into deadly war zones. After a malfunction Number 5 escapes from the military installation where the robots are being stored and wittily eludes military capture even after the other four robots are sent out to retrieve it. Johnny 5 reprograms the other robots to act out a scent from the three stooges to the dismay of the war mongering military troop. 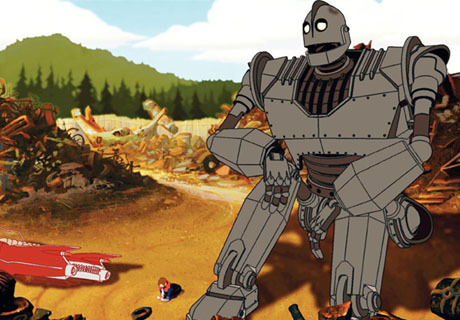 This film is about a giant metal-eating robot that crash lands on earth. The robot is about a hundred feet tall and has the ability reassemble himself if he gets damaged. The giant befriends a small boy and slowly learns lessons from the child. The robot unfortunately is seen as a threat by the military and a nuclear missile is launched towards the giants present location which turns out to be the middle of a populated town. Taking a lesson that he learned from the boy; "You are who you choose to be", the giant chooses to be a hero and flies into the missile in order to save the town. The movie Lost in Space features a robot simply named Robot by the young Robotic technission Will Robinson. The robot tragically gets left behind on the Proteus, a huge ship infested with a species of heat seeking carnivorousness spiders. The robot stays to blast the spiders away from the door of the ship while the crew flees to safety. Will remotely downloads the robots consciousness and Robot makes a reappearance later in the film. Sonny is the main robot character in the movie I, Robot. 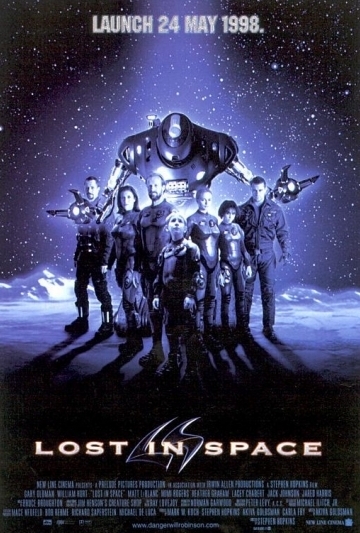 The film is based off of the writing of science fiction writer Isaac Asimov. The story is based around the idea that three laws that are programmed into robots can provide a perfect circle of protectance from AI. Sonny was built by a scientist with the ability to break the three laws. This gives sonny the somewhat unique ability to ignore direct orders and to directly harm a human being. 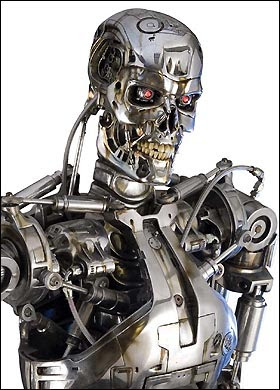 The T-800 model terminator was the featured character of film Terminator 2. This film takes place when a T-800 is reprogrammed and sent back in time to save the life of the future savior of the human race. The terminator has to fight off a T-1000; a stronger and more advanced model of robot. In the end the terminator prevails on destroying the T-1000 and manages to gather up remnants of the original terminator which were used to create the supercomputer Sky Net which took over the world in the future. The terminator destroys these parts but he knows that he has to be destroyed as well. Terminators cannot self-terminate and so John Conner has to lower the terminator into a pit of molten metal. As he descends the terminator gives John a thumbs up. That is the part where I cry. The PR2 is a real life robot developed by Willow Garage. The robot uses ROS an open source operating system for robots. 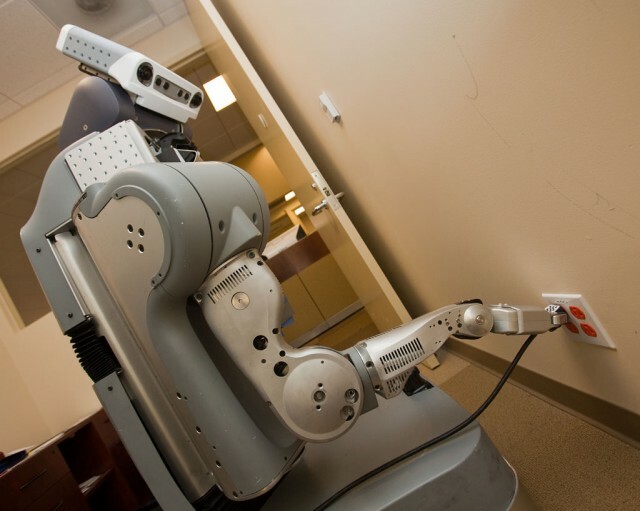 The photo above shows a PR2 plugging itself into a wall outlet for charging.